Hertz car hire bookings qualify to earn exclusive SouthAfrica.TO travel vouchers. Simply email a writeup and email of your car rental experience to scott@southafrica.to and we'll send you vouchers to reduce the cost of your next vehicle booked through SouthAfrica.TO. Easy. Ask for Assistance - SouthAfrica.to travel consultants are itching to show you the best car hire deal! Hertz has car rental agencies across South Africa, including at all the major airports in Johannesburg, Cape Town and Durban. Hertz is also known as "The Hertz Corporation" or "Hertz rent a car", and is the world's second largest car rental company. 9 December 2017. The value of Steinhoff shares plunges 80% in 2 days. Steinhoff owns Unitrans, which bought the Hertz Car Hire franchise in South Africa in 2008. 1 June 2017. Gareth Tindall, previously CEO of Hertz, has been appointed CEO of Rain (a company involved in mobile connectivity). 17 November 2015. Nobody wants to get in a car where there's fruit juice stickiness or any other kind of filth, however nobody wants to pay to clean it either! Hertz is no longer charging a cleaning fee for "normal wear and tear". However, if you smoke in the car you'll still be charged for the cost to remove the odour. 11 June 2014. Just found out that if you're a member of the Finweek Club, you can get a 12% discount on Hertz online bookings. From 31 May 2014 the Hertz online community, Be Hertz, is closed down: "All good things come to an end and we would like to thank you for taking this journey with us on Be Hertz! We sincerely appreciate all the support you have shown Be Hertz since its inception and would like to advise that although our online community is shutting down, Hertz will not let you down. Rest assured that your ability to use Hertz as your car rental company of choice will, in no way be affected. As we close this chapter and say our final thank you and goodbye, as a token of our appreciation, we will be sending you a voucher offering you a 20% discount on Hertz Car Rental (valid until 30th September 2014). You can expect your voucher before the end of May. Please note that the support@behertz.co.za mailbox will be closed as of 31st May. Should you have any Hertz-related queries thereafter, please don’t hesitate to contact Customer Care at cust.relations@hertz.co.za. Thank you again for your valuable contribution to Be Hertz. Regards, THE BEHERTZ TEAM. " The Be Hertz community were volunteers who agreed to participate in Hertz surveys, with the possibility of winning prizes through lucky draws. 31 March 2014 : Hertz SA have added the Nissan Evalia to their fleet. Seating 7 people, the vehicle offers a great alternative for large families to the Hyundai H1, VW Transporters, VW Kombis and Toyota Quantums. On the 7th April 2014 Hertz SA carried out a survey of their Gold Club Membership, with a carrot of a lucky draw for 3 R500 gift cards for participants. 25 Feb 2014 Hertz have launched their new website. The major changes include the addition of a brand-new navigation bar below the fold of the page and links to more general information at the bottom. These tweaks offer viewers a user-friendly design, clearly visible options to buy cars, book their chauffeur drive services as well as links to social media. On the whole this was a great idea, the revamp has increased the user-friendly qualities of their site in addition to making it more visually appealing. To increase customer input into their future marketing strategies, a survey was sent to previous Hertz clientele to provide feedback on the recent updates. The survey had incentive too! Chances to win prizes such as gift cards valued at R500 as well as movie tickets were offered as a thank-you for providing them with this valuable information. Included in the survey were layout questions concerning their homepage, honest opinions on some of their advertisement banners and whether or not the public would like to see prices displayed on future ads. 6 Dec 2013 Hangala Group, an investment company in Namibia will obtain 30 percent Herts Nambia's public shares. Herz CEO, Wils Raubenheimer said that they are "happy to consolidate (their) relationship with Hangala Group with whom (they) have had a long relationship dating from 2010." 20 Sep 2013. 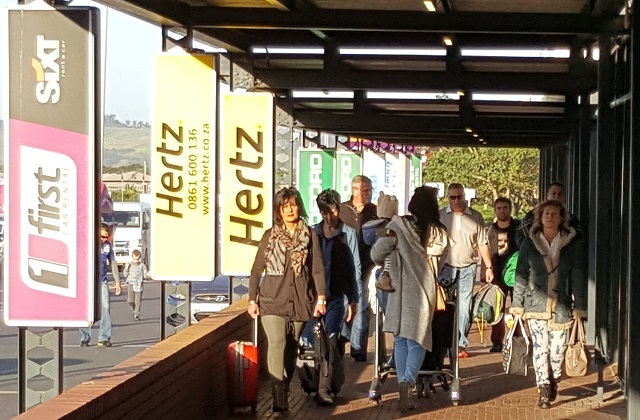 Hertz & Tourism Radio team up to provide Tourism Radio's audio travel guides for free with car hire from Hertz branches in Cape Town Downtown & Cape Town International areas. 2013-07-09. "Hertz launches Hertz 24/7, services that are available all day and night in Australia, France, Germany, Spain, the UK and the US - you make your reservation on the website and then swipe the 24.7 key fob on a reader on the windshield and the door opens, the key are on the dashboard. 8 Apr 2013. Holiday Holdings International is selected as Hertz's Southern African General Sales Agent, tasked for growing Hertz's outbound vehicle hire bookings from SA, Botswana, Swaziland, Lesotho, Zimbabwe and Namibia; to their 8800 locations worldwide. Sep 2012. After 2 years of negotiations, the Dollar Thrifty Automotive Group & Hertz Global Holdings have announced that Hertz are acquiring Dollar Thrifty: "The transaction provides Hertz instant scale with two new, well-established brands with airport concession infrastructure in the mid-tier value segment. We'll be a stronger global competitive player with a full range of rental options, not only in the US but in Europe and other markets, given Dollar Thrifty's strong international presence". said Mark Frissora, CEO of Hertz. The process took fairly long as a bidding war took place with Avis Budget. 1 Nov 2010. Hertz appoints Springbok rugby captain John Smit as brand ambassador. “An increase in demand for chauffeur services during recent years encouraged us to focus greater attention on the Hertz Chauffeur Drive and Transfer Services division of our operations. Adding muscle to the campaign was definitely the right move to make, and John is playing an important role in promoting our brand. Of course, John also makes use of our Chauffer Drive Service whenever he needs it. We decided to get John involved in the relaunch of our Chauffer Drive Service because he embodies the qualities that we want to promote: he is professional, likable, reliable and popular.” says Jonathan Odes, Public Relations Officer at Hertz’s. 19 Feb 2009. The opening of a new Hertz Car Rental office at Paarden Eisland (Cape Town), and the relocation of the Hertz Head Office in Illovo to Kempton Park (Johannesburg) and the Illovo branch to Randburg. 15 Dec 2008. Hertz announces the appointment of Brendan McCarthy as its new National Chauffer Drive Manager. Oct 2008. Hertz pranks Cokey Falkow at Johannesburg O.R. Tambo offices. 2008. 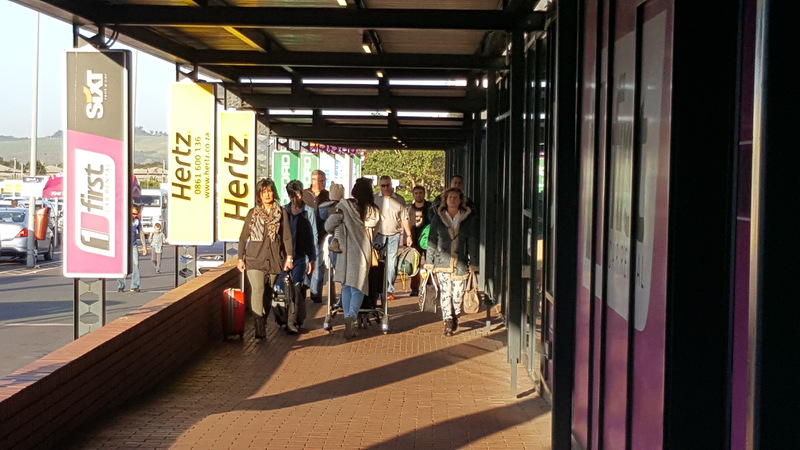 Unitrans, which is owned by Steinhoff, purchases the Hertz Car Rental franchise in South Africa. Hertz turns 90 years old. Laura Theunissen and Kgagamatso each win a Garmin GPS as part of a Hertz rent a car "spot the car" competition. Hertz takes delivery of eighteen branded Volkswagen Polo Playa vehicles. Hertz opens its 32nd office in southern Africa at 2 Bird Street, Stellenbosch. The branch is headed up by Miranda le Grange. Mark Wood joins Hertz as the Manager of Sales and Operations of Hertz Southern Africa. Simulataneously, Pat O' Brien is being appointed Divisional Chief Executive, replacing Gareth Tindall who will remain as a non-executive until June 2008. Tindall, joined Hertz in June 2005. Hertz starts providing (in the USA) "Nick on the Go", a portable media player, to customers driving with their kids. The player is pre-loaded with shows like "Dora the Explorer" and "SpongeBob Squarepants". Hertz introduces its range of fuel-efficient, environmentally-friendly cars (the Green Collection). Hertz members can make reservations for specific makes and models. Hertz starts operations in Beijing, Guangzhou and Shanghai. Hertz announces that it will be reentering the South African car rental market, after a 5 year absense. Imperial Car Rental signed a 5 year franchise agreement with Hertz to handle their bookings in South Africa (Hertz in turn will handle Imperial's bookings outside of South Africa). Hertz stops using OJ Simpson in its advertisements. Hertz introduces its #1 Club Gold® Service. Walter Jacobs, the founder of Hertz, dies. Hertz introduces Computerised Driving Directions. Hertz goes on-line, 24 hours a day, 7 days a week. Hertz establishes its worldwide reservations centre in Oklahoma City. Hertz Equipment Rental is established. At the assassination of JFK, A big billboard marketing Hertz was up on the roof of the Texas School Book Depository in Dealey Plaza. Walter Jacobs, the founder of Hertz, retires as Hertz's president. The Hertz Corporation is listed on the New York Stock Exchange. Omnibus purchases Hertz Car Rental from General Motors. Hertz opens a rent-a-car facility at Chicago's Midway Airport, to assist people engaging in the flying phenomenon. At the age of 22, Walter Jacobs starts renting out a fleet of 12 Model T Fords in Chicago, USA. Hertz is listed on the New York Stock Exchange (for the third time!) with the symbol "HTZ"'. Hertz is purchased by Clayton, Dubilier & Rice; Merrill Lynch Private Global Equity and The Carlyle Group (private equity companies). The group pay $5.6 billion in cash. Hertz delists (again) and Ford purchases that part of Hertz which it does not already own (18.5%). Hertz is listed the New York Stock Exchange (for the second time), under the symbol "HRZ". Volvo North America joins Hertz management and Ford as a co-investor in Park Ridge Corporation. Park Ridge Corporation purchases Hertz. Park Ridge Corporation is ownd by members of Hertz senior management and the Ford Motor Company. The Hertz Corporation is purchased by the RCA Corporation. General Motors purchases Yellow Truck, and along with it gets Hertz Drive-Ur-Self System. John Hertz purchases Walter Jacobs' car rental operation, and it becomes part of Hertz's Yellow Cab and Yellow Truck and Coach Manufacturing Company. John Hertz renames the company Hertz Drive-Ur-Self System. A car rental organisation is set up by Walter Jacobs in Chicago, USA. 2013-07-20 Best Car Rental Chain : Hertz has been named the best car rental chain in the world, by readers of Frequent Business Traveller magazine! Write a review of your Hertz rental and we'll send you a discount voucher to reduce the cost of your next car rental! Simply email us to let us know why you chose Hertz & how it went. Include photos for a higher voucher. There are a variety of ways in which you can make your reservations for Hertz Car Rentals, but the most popular is via the website. Citroen C1, Kia Picanto, Honda Jazz, Toyota Corolla, Polo Vivo, Honda Civic, Kia Sportage, BMW 320i, Mercedes Benz C180, VW Kombi. Kia Picanto, Chevrolet Aveo Hatch, Toyota Corolla Sedan, Kia Rio, Kia Sportage 2x4, Mercedez Benz C180, Mercedez Vito, Ford Ranger 4x4 D/Cab, Isuzu 2x4 S/Cab. Air France, Auto Navigator, AA, EventsNow, Redengine, SAA (South African Airways) & Southern Sun. Hertz Car Sales are responsible for selling the Hertz car and van rental fleet, to trade buyers and private purchasers. Hertz Claim Management provides claim management services for car and general liability claims. Hertz Equipment Rental rents out and sells heavy equipment, tools and machinery. Hertz Lease offers leasing and fleet management services throughout Hertz's franchise network in Africa (including South Africa), Europe and the Middle-East. Hertz Truck and Van Rental rents tracks and vans for business and personal use. Mark Frissora is chairman of the board an CEO, Joseph Nothwang is President of Vehicle Rental and Leasing ( Pacific and Americas), Gerald Plescia is President of Hertz Equipment Rental Corporation and Michel Taride is President of Hertz Europe. CEO in South Africa is Pat O’Brien.